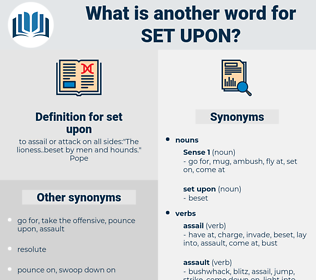 What is another word for set upon? let go, surrender, compliment, praise, retreat, uphold, help, yield, exonerate, protect. leave alone, support, submit, be lazy, slough off, aid, lose, sustain, shield, resist, shelter, defend, assist, guard, withstand. pass up, not touch, tap, miss. steepen, stephen, steuben, step in, stewpan, stephanion, stave in, step on, stiffen, step-in, staff vine, skidpan. 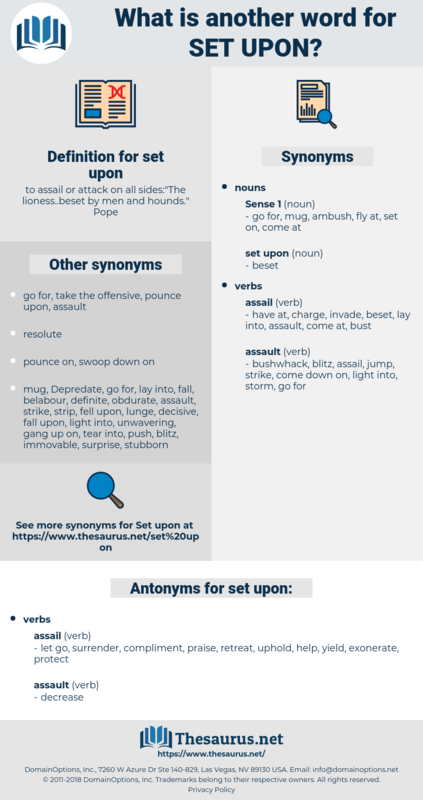 assault, set on, attack, assail.